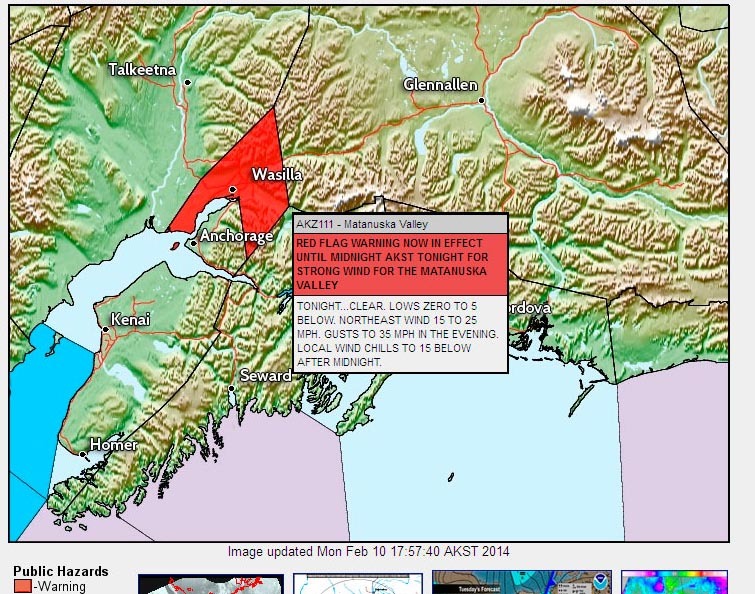 Wind-blown dust in Haines and other places. Red flag wildfire danger for the Mat Valley. Strong pressure gradient along coast. The strong “January thaw” that pushed well into the interior and tied the all time January record for Alaska is being pushed toward the back of our memories by seasonal and colder weather. Boy, it feels colder after a long warm spell! Wind chills here in northern Southeast Alaska are bouncing down to 5 to 15F below zero (-20C to -26C) at times. The wind tunnel of Lynn Canal has had sustained 50 kts with gusts to 76 (58/88 mph, 26/39 m/s), while Juneau has had moderate Taku winds, which come over the mountains instead of around them, giving them a particular gustyness. Southcentral has been feeling the cool-down and wind for several days. Gap winds funneling through the mountains on their way to fill ocean low pressure areas hit the usual Palmer, Whittier, (sustained winds ~35 mph with gusts to ~58 [15G26 m/s ]), and Valdez (30G50 mph [13G23 m/s]). River flats left bare from the recent thaw provided the light glacial silt so easily picked up by the winds. Both Palmer and Haines reported haze or blowing dust with visibility dropping to 2 miles (3 km) at Haines (the Haines airport is closer to the river than at Palmer.) Meanwhile interior temperatures have fallen 80+ Fahrenheit degrees (50 Celsius degrees) in some places since late January! The most interesting thing about this weather event, in my opinion, is that it is really nothing out of the ordinary. Many days of every winter are spent tying things down or chasing them down all along the coast. Many worse wind storms have come and gone, even this winter. Take Skagway. The peak wind of 36 kts (41 mph, 18 m/s) yesterday has already been endured there on 36 other days since November 1st of this winter, 11 days with a more respectable 43 kts or 50 mph (26 m/s). The warm spell in the last half of January was in a different class. Quite a few stations have new records for January, either single warmest day or warmest January average. Many others place it in the top 3 or top 5, etc. But, as warm and record-breaking as it was, there were past times when it was, depending on the individual spot you’re looking at, almost as warm as, as warm as, or even warmer than January 2014. Alaska winter weather has always included wild swings between warm and cold. Looking at averages does not tell the whole picture. Look at this graph of Anchorage temperatures from 1992. Then click on the graph to browse other years at the NWS site. You’ll see a common theme, with many variations: winter temperatures spend about as much time in the extremes as they do in the so called “normal” range. Around March things settle down, and the summer weather sticks much closer to the score. Similar tune for most parts of Alaska. Yes, there are some stable, in-between weather periods…winter weather nirvana to most of us. Lets hope for some more of those before the winter is over. What are the ups and downs of weather where you are? What is your idea of winter weather nirvana? Please use the comments link for feedback or questions. Is April a dire weather month in Alaska? so where did the name “williwaw” come from? I remember hearing this as a child in Kodiak in the 1950s. Is this an Aleut word? Hi, Thanks for the question. Sorry to take so long to answer. The origin of the word Williwaw is not clear, but as it is also commonly (and probably earlier) used in South America, it is probably not of northern origin. One theory is that it is derived from the term willy-willy, an Australian term for a dust devil but also used (mostly in the past) for a tropical storm.